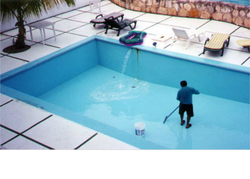 We are offering best quality of Pool Maintenance to our most trusty customers. They are very granular. These products have chemical imbalance in pool water, and removing the unwanted dirt and other particles from the swimming pool. 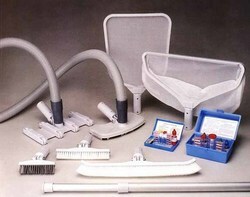 These are used for maintain the chemical , water temperature, and heat resolution in pool water. Our company is engaged in providing Tensile Membrane Facades Maintenance Service to our patrons. Our experts have affluent industry acquaintance and knowledge of this area. Our experts always work with full dedications to render this service within a stipulated time period. No one likes the chore of pool service, but regular care keeps the water clean and balanced, and your equipment functioning properly. The good news is that pool maintenance is easier than ever, and should take no longer than a few minutes a week. Maintaining your pool can be a tedious job, but it's an important part of keeping your pool sparkling clean and safe for years of enjoyment. Swimming Pool:A rooftop swimming pool with a standard safe depth of 4 ft overlooking the busy Thondayad Bypass road and entire region giving you a bird’s eye view of the Coco land to the farthest you can stretch your vision. On arrival the guests are greeted in the grand lobby over looking the beautiful landscaped lawn and swimming pool.